The interior ministry of the Republic of Tajikistan announced on July 31, 2018, that the terrorists who killed four foreign tourists on July 29, 2018, were members of the ISIS movement who underwent terrorist training in Iran. The four were among seven European and American cyclists who were riding through southern Tajikistan in the Danghara district, between the city of Kulob and the capital, Dushanbe. A car repeatedly rammed the tourists when they were about 70 km away from the capital. After running them down, the attackers got out and stabbed them. Three were killed on the spot, and another one of the casualties died in the local hospital. The fatalities included two Americans, one Dutch, and one Swiss. Three more cyclists were wounded. The Tajikistan police announced that it managed to kill four of the attackers, who were attempting to flee the country to Afghanistan. Another five suspects involved were arrested. The two Americans killed in the attack, Lauren Geoghegan (left) and Jay Austin, both 29 years old. An ISIS claim of responsibility in English. Was the act committed by an affiliate? ISIS has taken responsibility for the attack, but senior Tajik interior ministry officials told the BBC that ISIS was not connected to this incident, but an affiliated Islamic movement, the Tajik Islamic Renaissance Party (TIRP), whose activities were legally banned three years ago, planned and carried out the attack. The notice from the Interior Ministry in Dushanbe claimed the leader was Hussein Abdul Samadov, an active member of the movement. The report added that Abdul Samadov visited Iran four times, where he underwent military and ideological training. The announcement stated that Abdul Samadov and his friends were in training camps in the regions of Qom and Mazandaran in Iran in 2014 and 2015.1 The interior ministry said that its announcement is based upon confessions extracted from one of the arrested suspects. Interior Minister Ramazon Rahimzoda stated that his office had set up a team to take investigate the attack, which is acting under the direct supervision of President Emomali Rachmon. Danghara, the location of the attack on American and European tourists in Tajikistan. The terrorists ran down a convoy of cyclists and then stabbed the wounded to death with knives. The accusation by the Tajiki Interior Ministry about Iran’s part in the latest terror attack has renewed tensions between Dushanbe and Tehran. The Islamic Renaissance Party of Tajikistan (IRPT), which was founded in 1990, has strong ties with Iran. It was first outlawed in Tajikistan in 1993. The party took part in the Tajik civil war (1992-1997), and after a peace agreement was signed with the government in 1997, its activities took place openly between 1998 and 2015, with government permission. In 2015, its activities became official, with two of its representatives elected to the 63-seat Parliament. However, Tajikistan declared again in 2015 that the party was a terror organization. It cancelled its permission for its activities and even arrested dozens of party activists, sentencing them to long prison terms. Yet the ties between the party and Iran strengthened from 2015. In December 2015, Iran did not only invite Muhiddin Kabiri, chairman of the Islamic Renaissance Party (IRPT), to a conference that took place in Tehran, entitled “Islamic Movements around the World.” There was also a meeting between Ayatollah Ali Khamenei, Leader of the Iranian regime, and Kabiri that aroused the anger of Tajikistan, who summoned the Iranian ambassador to the Foreign Ministry. A senior Tajik religious official connected to the government said that inviting Kabiri to Tehran would “encourage terrorist acts” in Tajikistan by Iran. Relations between Tehran and Dushanbe continued to deteriorate. In 2016, the Tajik government closed its branch of “The Imam Khomeini Assistance Committee,” which operated in Tajikistan, and also banished the cultural attaché of Iran at the Iranian embassy. Tajikistan suspected that the Iranian “Assistance Committee” and the cultural attaché of Iran had connections with supporters of the Islamic Renaissance Party (IRPT) and were providing funds and other means to turn them into their mercenaries. A short while after extremist supporters of the Iranian regime attacked the Saudi Arabian embassy in Tehran; President Emomali Rahmon paid a visit to Saudi Arabia. At a meeting with the Saudi king, Rahmon condemned Iran, which Iran interpreted as another step by Tajikistan to continue cooling its relations with Tehran. In April 2017, Muhammad Javad Zarif, the Iranian foreign minister, visiting central Asia, did not go to Tajikistan, despite meetings held earlier in the hope of improving relations.4 At this time, Tajikistan again accused Iran of supporting the IRPT and even held an official protest in Iran. Tajikistan even canceled the memorandum of understandings that it signed with Iran to provide entry visas to Iranian tourists on their arrival at the country’s airports. At the same time, Dushanbe signed a cooperation agreement in the fields of security with Saudi Arabia, which Iran interpreted as a step toward Saudi Arabia and the United Arab Emirates, further distancing Tajikistan from Iran. In April 2017, it was announced the Shanghai Cooperation Organization (SCO) rejected a request from Iran to join it as a result of Tajik opposition to this application. Iran’s application is still under consideration. President Rahmon and Iran’s Foreign Minister Javad Zarif, April 2018. 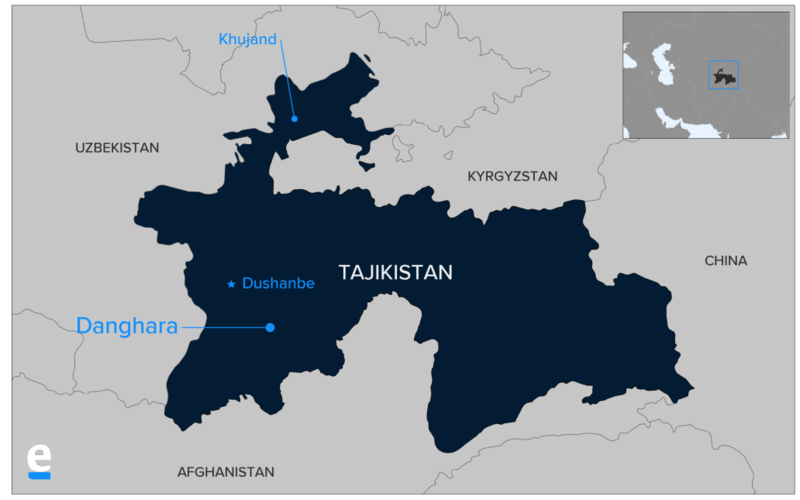 (Isna agency) Tajikistan accuses Iran of continuing to support over the outlawed Tajiki Islamic movement. According to Dushanbe, most of the operational connections between Iran and the Tajik Islamic Renaissance Party were established through Abdelhalim Nazarzoda, or Haj Halim, former Tajiki deputy minister of defense, who in the 1990s was one of the commanders of the activist cells of the movement. Government forces killed Nazarzoda in September 2015 in a campaign that took place in the Dushanbe suburbs against what the government termed “an attempted revolution”7 carried out by the outlawed movement. Despite soothing messages from Iran, the upper executive body in the province of Khatlon in Tajikistan accused Iran’s Revolutionary Guard in the spring of 2017 of training TIRP militias. The announcement stated that members of the movement underwent training in camps in Iran, Syria, Iraq, Lebanon, Yemen, and Afghanistan. In August 2017, Tajikistan again blamed Iran for the murder of many of its citizens, including Zafar Ali Kanji, a former Parliamentary speaker. The Tajik interior ministry accused Iran of financing terrorist acts carried out by the elements of the Islamic movement trained in Iran. Through an announcement from its embassy in Dushanbe, Iran denied any involvement in murder or revolution, stressing that ties should be strengthened due to cooperation and interdependence between both countries in the field of energy.